The Patriots were once again victorious on Sunday in Foxboro, their last regular season game prior to the playoffs starting. In winning their 12th game of the season, they guaranteed themselves of at least the #2 seed and a bye week in the opening round of the playoffs, something they really will need moving forward considering all of the injuries they’ve suffered. We’ll take a final look at some of the key plays on Sunday before we move on to the second game vs the Jets this year. Using the NFL Game Pass’ All-22 coaches’ film, we get a good look at the plays and how they developed. Bolden Nine Yard Run: On the Patriots opening drive and first play from scrimmage QB Tom Brady lines up in the shotgun with Bolden beside him on his left. At the snap, LG Shaq Mason pulls and leads the way into the second level with a great block sealing LB Avery Williamson. Bolden cuts back against the grain back to the left and appears ready to break it for a long gain towards the sideline before he’s tripped up on a shoe string tackle. It was a good way to get started by the Patriots offense and good patience and vision by Bolden. LaFell 29-Yard Cross: Also on the Patriots opening drive was a big 29-yard pass play from Tom Brady to Brandon LaFell. In our keys to the game last week we thought the middle of the field would be a good place to attack. The Titans inside linebackers take deep drops in their zone coverages and much like early in the Pittsburgh – Denver game, were vulnerable to the underneath shorter passes. Josh McDaniels and Brady recognize this early in the first drive and LaFell lined up on the right side is Brady’s target. LaFell crosses shallow from right to left just beyond the line of scrimmage and Brady hits him in stride as the linebackers are too deep to influence the play. Brady and LaFell stretch the field horizontally and as LaFell turns the corner, he’s got plenty of room to run before the safeties force him out of bounds. It was a great call and even better execution from Brady and LaFell. Gronkowski 5-Yard Touchdown: To cap off the Patriots first drive, the Patriots found themselves on the Titans five-yard line. Tight end Michael Williams and Danny Amendola are aligned to the right, Rob Gronkowski is inline and WR Keyshawn Martin are on the left side. The Titans are in man-coverage with a single deep safety in the middle of the field. Gronk is singled up on linebacker Avery Williamson, a mismatch and Brady recognizes it immediately. Amendola is also open on a short cross with Williams underneath but Brady’s first read is on Gronk. He releases straight up the field to about the one-yard line before cutting outside to the left towards the pylon. Martin drags his defender toward the center of the end zone on a deep slant, leaving Gronkowski plenty of room. Gronk beats Williamson easily and it is an easy pitch and catch for Brady for the touchdown which put the Patriots up 7-0. Amendola was also wide open in the center of the field for Brady who had two easy options for the touchdown. Hicks Sack: Defensive lineman Akiem Hicks has really turned it on lately for the Patriots. He’s been solid against the run but has regained his explosiveness that he was known for when he first joined the Saints. He logged a pair of sacks against the Texans and got another against Tennessee as well as return a fumble for a touchdown. On his sack the Patriots had him inside on the left side lined up as a three technique right over the guard. At the snap Hicks attempts to bull-rush the guard over his outside (right) shoulder. 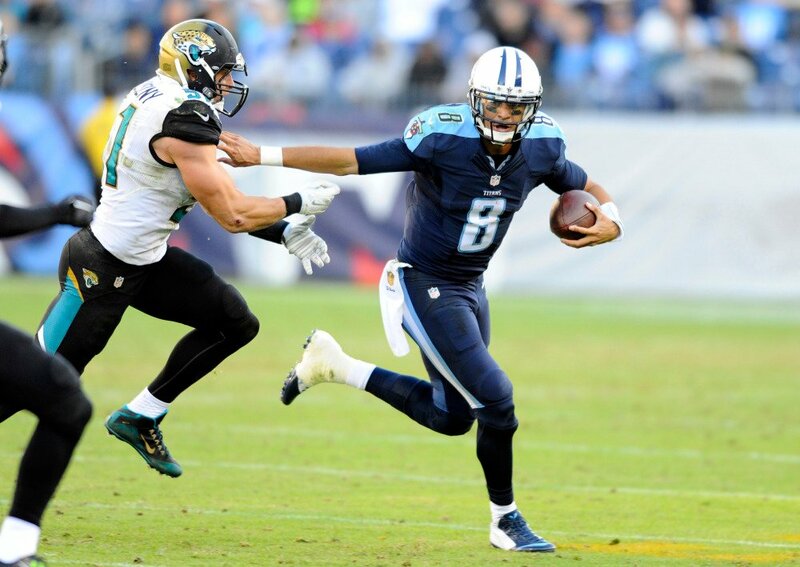 QB Marcus Mariota can’t find anyone open as the pocket collapses. RB Bishop Sankey drifts out into the right flat; DE Jabaal Sheard peels off and takes Sankey into the flat. Jerod Mayo is no longer responsible for Sankey and comes on a delayed blitz. Hicks spins and comes hard inside over the guards left side and meets Mariota as he tries to step up in the pocket. Hicks gets the sack with Mayo right on his heels. It was a perfectly executed play by the Patriots defense who gave Mariota nowhere to go with the ball and with no room to scramble in a collapsing pocket. White 30-Yard Touchdown Pass: On Brady’s second touchdown pass of the day and his 35th of the season, it was another very well executed play by the Patriots offense where the offensive line got plenty of big bodies downfield quickly to help spring White for a highlight reel catch and run to the end zone. At the snap, White drifts out into the left flat; the Titans OLB is coming hard on a pass rush to the inside on Sebastian Vollmer and is easily sealed. The safety inexplicably is drifting to the right and isn’t in a position to help. Josh Kline, David Andrews and Shaq Mason all get downfield quickly to help and have more blockers than the Titans have defenders to contend. The two defenders in the area are sealed by Kline and Andrews allowing White a clear path between them. The defensive linemen don’t have the speed to catch White as he cuts back to the outside, avoids the tackle by Wesley Woodyard and gets two outstanding downfield blocks from LaFell and Amendola. The result is another easy pitch and catch for a touchdown. White showed great patience and the blocking downfield was superb. White is really coming into his own now as a receiver out of the backfield. White 70-yard reception, called back OPI: The one play everyone keeps going back to on Monday is the 70-yard pass play from Brady to White that was wiped out by a offensive pass interference penalty (OPI). It was during the 4th quarter and the Patriots were facing a 3rd and 7 from their 23-yard line. Keshawn Martin is lined up on the left side and is supposed to run a cross and take the defender inside and allow White who is coming out in the flat some clear running room. Martin releases inside and is met with a defensive end at the 24-yard line, within a yard of the line of scrimmage and within the legal limit. It was the defensive end who initiates contact trying to jam Martin at the line of scrimmage. LaFell drags his defender on a deep post and once White has the ball, blocks downfield and allows White to cut inside where he ran all the way to the five-yard line before being finally brought down. Instead of a first and goal at the five, the Patriots faced a 3rd and 13 which forced a punt. On the ensuing drive by the Titans, Delanie Walker caught a long touchdown pass making it a 14-point turnaround. This entry was posted in Patriots Commentary, Patriots Film Room and tagged 2015 NFL Season, 2015 Patriots Season, All-22 film study, Avery Williamson, Bill Belichick, Brandon LaFell, Brian Orakpo, Chandler Jones, Danny Amendola, Jabaal Sheard, James White, Julian Edelman, Keshawn Martin, New England Patriots, NFL, NFL Game Pass, Patriots, Patriots edge rushers, Rob Gronkowski, Tennessee Titans, Tom Brady, Wesley Woodyard on December 22, 2015 by Steve Balestrieri.